Considering the consequences associated with interventionism, the implementation of a political strategy entailing a de facto partition of Syria has been gaining considerable support. Politicians – particularly former US Secretary of State John Kerry – have come to view state partitioning as a best possible management tool to the situation in Syria. Although the implementation is controversial, as the partitioning of a state may be accompanied by an increase in violence, Syria may prove to be a deviant case in which a de facto partition is the most feasible option, if not the only option at this point in the conflict. The most prominent voices in the partition debate, that are focused on the security dilemma that arises as a result of ethnic tensions, suggest that in order to achieve sustainable peace, ethnic factions must be completely partitioned into separate cantons under a federal state framework. Fairly recent “[e]mpirical evidence has supported the ethnic security dilemma, with case studies and cross-national results demonstrating consistently that partitions that separate ethnic groups maintain peace for at least five years.” A comprehensive empirical study conducted in 2007, which reanalyzed data of all civil wars from 1945 to 1999, suggests that de jure partitions – meaning complete separation from one state into an independent state – has a strong pacifying effect after a civil war. However, the current situation in Syria, in which President Assad shows no indication of devolving power, suggests that the complete secession – de jure partition – of three cantons from Syria is not feasible at this point. Rather, it would appear that the most viable alternative to the violent re-establishment of Alawite hegemony in Syria is a de facto partitioning of the state, which would result “in autonomous centralized cantons under a weak federal government.” In that case, the right model to be implemented in Syria is neither one that resembles such attempted in Afghanistan, nor Iraq, nor Libya, but rather that of Bosnia. …partitioning Syria is not a means to an end in addressing the civil war, but rather a strategy to be utilized in mitigating the atrocities. Photo: Is Partitioning Syria a Viable Option? (2016), by Jacob Purcell via Global Risk Insights. Partitioning Syria along identifiable demographics is the most feasible solution because “the more intermixed the pattern of settlement of the hostile populations, the greater the opportunities for offense by either side; and it becomes more difficult to design effective measures for community defense except by going on the offensive preemptively to ‘cleanse’ mixed areas of members of the enemy group and create ethnically reliable, defensible enclaves.” As such, the current security dilemma unfolding in Syria suggests that the conflict is unresolvable. The process of federalization and devolution of power that would result in de facto partition of Syria would, with time, allow for the opposing parties of the civil war to establish a peace agreement – similar to Bosnia’s Dayton Accords – and then, under a federal framework focus its abilities to waging war on ISIS. Although the world watches the Syrian crisis in a stunned silence, is it fair to ask what could or should be done that is not being done already? At times, even the best policies will conjure up failures, as every strategy is dictated by context – the current realities on the ground. Thus, partitioning Syria is not a means to an end in addressing the civil war, but rather a strategy to be utilized in mitigating the atrocities. We ought not to pretend that there is a simple way forward in Syria without seriously considering the significant risks and costs to both Syria itself, and to the international order. If, however, “all options that could save Syria are ignored and the country is abandoned to the chaos of sectarian provocations, regional tensions, and international interests, Syria will be yet another mirror of the failure of the international order.” Certainly, the true strength and effectiveness of the NATO Alliance is being tested today, and as a result, it will have to closely evaluate its approach to Syria. NATO might well be able to utilize its diplomatic power to effectively achieve a partition of Syria, but once committed to such a mission, will it be prepared to see the inevitable bloodshed through, and thus solidify an end to the civil war? It would appear then that “the Syrian crisis has become a Gordian knot that cannot be easily disentangled. As daunting as the crisis looks, there is a cost to inaction – in human suffering, regional instability and damage to America’s global standing.” Thus, NATO must work towards the stabilization of the Assad regime and pursue a negotiated political settlement that brings about the de facto partitioning of Syria. Once this has been achieved, NATO could potentially secure its objective of not only mitigating the hostility of the civil war, but it would also make it feasible for refocusing its efforts to degrading ISIS. This strategy “does not mean allying with Assad or treating him as a partner but rather putting the goal of ending the fighting before the goal of toppling Syria’s government.” If a negotiated political settlement can be reached, then there may be some hope left for Syria. If not, then it may be the case that the fall of Syria will continue following in the path of Libya and Iraq, where bloody civil wars continue to devastate its people. 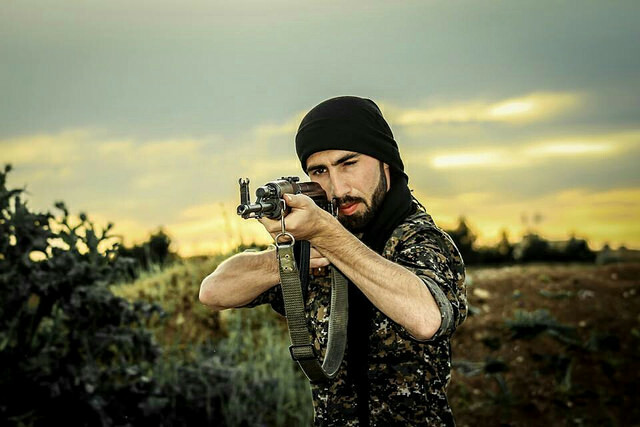 Photo: Kurdish YPG Fighter (2015), by Kurdishstruggle via Flickr. Licensed under CC BY 2.0.